Trying to take photos of ice cream and ingredients without a macro lens has been quite frustrating, so I talked my brother into letting me spend some ice cream money on my Nikon D80. 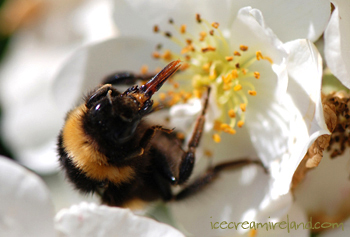 After all, there is the possibility of an ice cream book, and one would want it to look well. After much research, I decided on a Nikkor 105mm micro lens as well as Nikon’s close-up R1C1 flash system. I have to say I’m already in love with the lens. I unpacked the lens and took it straight into the garden. 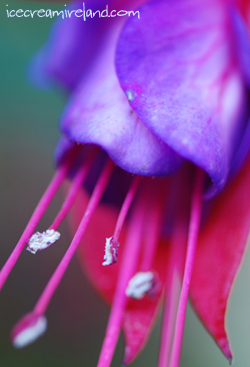 The fuscia above and the bumblebee are the result. I can’t wait to work out the flash system and try it out on food! For those in the catering business, there is a new chocolate company out there, started by Olivier de Loisy, a son in the family that started Valrhona. 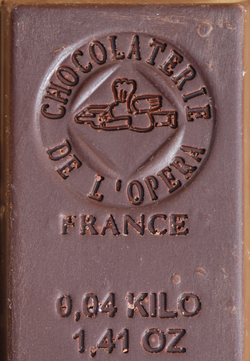 Chocolaterie de l’Opera is priced slightly lower than Valrhona, and they have a range of single estate chocolates for catering only. The chocolate is very good, although my brother and I both think that Valrhona still edges it in terms of clarity of flavour. It’s definitely worth a taste, though, if you’re looking for chocolate for your kitchen. 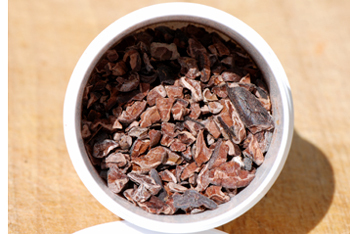 One of their most interesting offerings is toasted cocoa nibs (right). We could definitely find a use for those! The distributor in Ireland is La Rousse Foods. It often is hard to find good staff in Dingle, but this year things are verging on the ridiculous. Our shop manager, Russell, is leaving us, and we’re going into the season short four people in our Dingle shop. We have ads in and notices up, and we are getting very few replies indeed. Staff shortages are a Dingle phenomenon, at least when it comes to the service industry, and the situation has become more difficult in recent times. 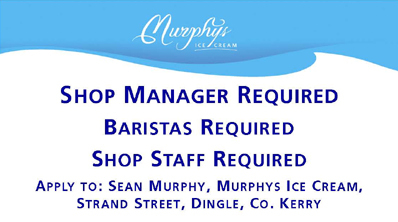 We have loads of interest every time we hire in Killarney, but take a walk through Dingle, and you will see a parade of help-wanted signs in shop and restaurant windows. If it wasn’t for the influx of foreign nationals, I think Dingle would have to shut down. What to do? It’s always been possible to pick up a few college students, but that doesn’t help much come October, when we still need staff and students are back in school. We need a core of permanent employees. The addess is Marble Hill, Boreenmanna Road, Cork. This evening, Sean met Michael McDowell at his constituency office in Dublin, where the Justice Minister had returned after a long day on the campaign trail. Mr. McDowell kindly made time for a photo. Position on ice cream: I like ice cream. I think this will be the final one in the series, as tomorrow there is no campaigning… Best of luck to all the candidates, and my apologies to all the ones we missed! My brother Sean recovered sufficiently from his chocolate tasting in Dublin (yes, I’m still jealous) to find Enda Kenny, the leader of Fine Gael. 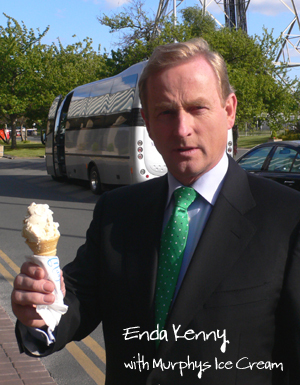 Sean reports that the possible future Taoiseach was warm and friendly and clearly has his finger on the pulse of the ice cream community (see position statement below). Things are looking up for this series since Shane Hegarty mentioned this site and included the photo of Jackie Healy Rae in the Irish Times today. It seems we were discussed on Morning Ireland as well. 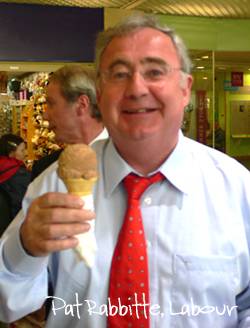 My brother is in Dublin for a chocolate tasting (lucky fellow) and customer visits, and hopefully he willÂ find time to get more photos or arrange a video ice cream interview with a candidate or two, which we’ll put up if it comes off. 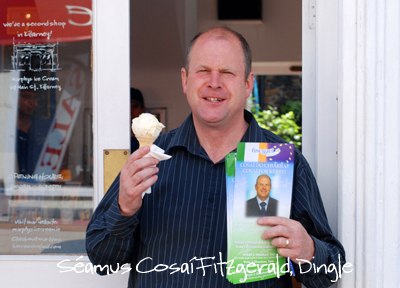 Here, in the Kerry South constituency, it is a very tight race for two of the three seats, and the latest candidate caught with ice cream is Cosai Fitzgerald. 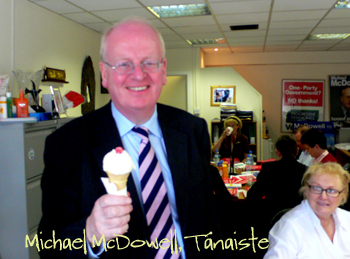 He is a serving counsillor for Kerry County Council, and we’ve known him for quite a while (he isÂ also on the board of ÃšdarÃ¡s, our landlord for the factory). 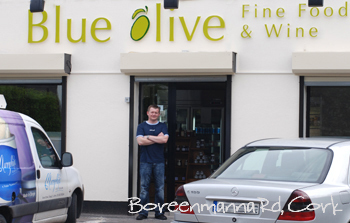 He is local to West Kerry andÂ has been very supportive.